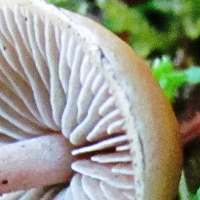 The cap colour of this uncommon mushroom is very variable and therefore not a helpful identification feature; however, that is hardly a problem because the snakeskin patterning on the stem is so distinctive. In Britain and Ireland the Snakeskin Brownie is an occasional find, although it is locally common. 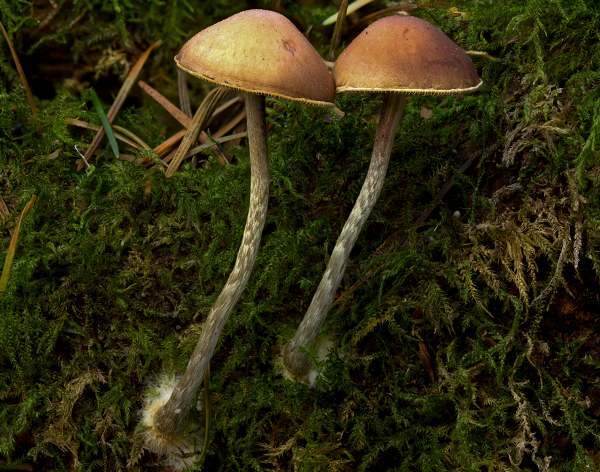 Hypholoma marginatum occurs also throughout most of mainland Europe and in many other parts of the world including North America. When in 1796 Christiaan Hendrik Persoon described this mushroom scientifically, he gave it the name Agaricus marginatus. (Most gilled mushrooms were initially placed in the genus Agaricus in the early days on fungal taxonomy.) It was German mycologist Joseph Schröter (1837 - 1894) who, in 1889, established the currently accepted scientific name of this species as Hypholoma marginatum when he transferred it to the genus Hypholoma. Synonyms of Hypholoma marginatum include Agaricus marginatus Pers., Agaricus dispersus Fr., and Hypholoma dispersum (Fr.) Quél. 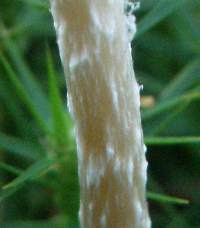 The specific epithet marginatum means 'with an edge or border'; it is is a reference to the silky-white remnants of the partial veil that usually adhere to the cap margins. 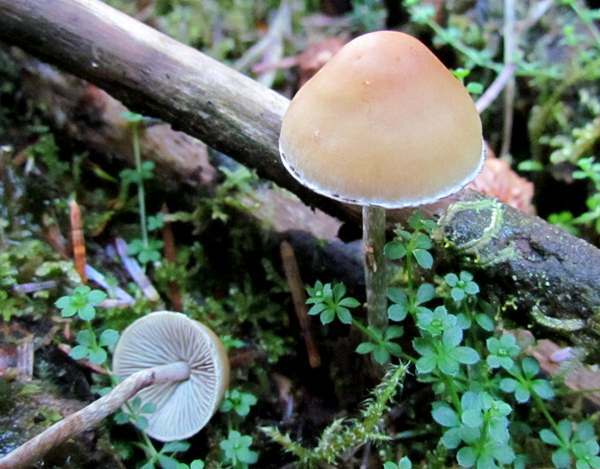 Generally considered inedible, this woodland mushroom is easily confused with other fungi (for example Sulphur Tufts) from the same genus that are also inedible or even poisonous, as well as possibly with Galerina marginata, commonly referred to as the Funeral Bell, which as its common name proclaims is deadly poisonous. If you need a further disincentive the small size and infrequent occurrence of the Snakeskin Brownie surely make it a mushroom that is not worth collecting to eat. 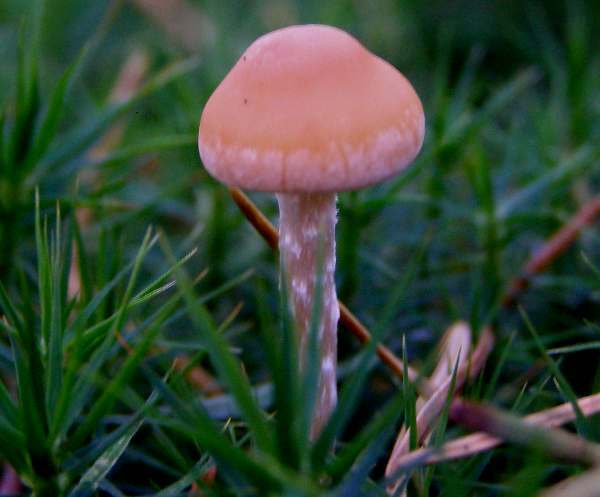 4 to 9cm across, convex, flattening out at maturity but retaining a shallow umbo; inrolled margin of young caps is covered with silky remnants of the partial veil; colour rather variable but most often brick red in the centre and paler towards the margin. 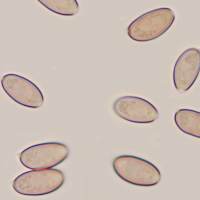 Adnate; crowded; cream turning olive then purplish brown as spores mature. 5 to 10cm long and 0.6 to 1.5cm diameter; fibrous; light ochre at apex, darkening progressively to a reddish-brown base; a faint ring zone isusually discernable. 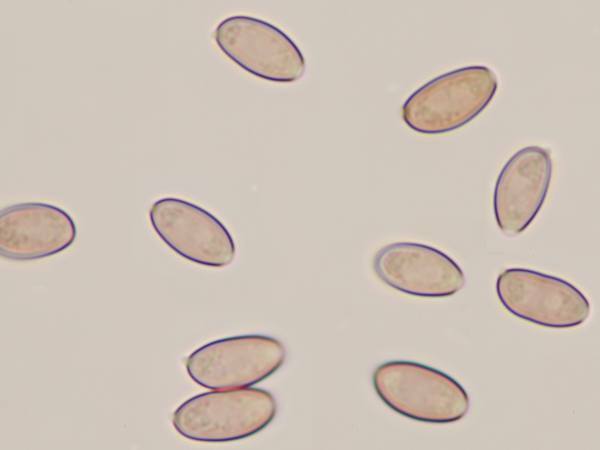 Ellipsoidal, smooth, 7-9 x 4-5µm; with a small germ pore. No significant odour; the taste can be mild or bitter. Considered inedible by most authorities. 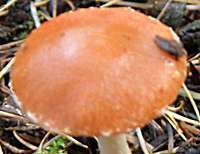 Saprobic, usually in trooping groups and often tufted, on soil laden with conifer needles in woods and forests; sometimes seen growing on well-rotted softwood stumps or fallen trunks. 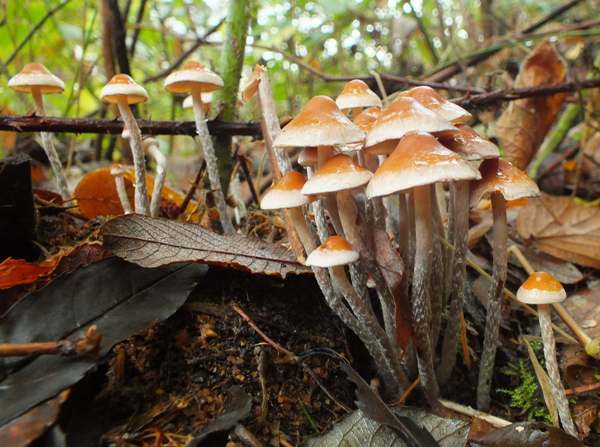 Hypholoma capnoides, commonly referred to as Conifer Tuft, is paler and grows in groups or small tufts on conifer stumps; in most parts of Britain it is more common than the Snakeskin Brownie.